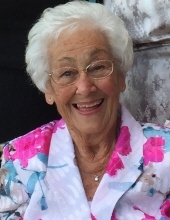 Anne “Babe” DiGrazia, age 95, resident of Lockport, IL, formerly of Summit, IL, passed away on Wednesday, January 30, 2019. She was born February 27, 1923 in Chicago, IL. Beloved wife of the late Phillip J. DiGrazia; loving mother of Guy DiGrazia, Philip (Patti) DiGrazia and Paula (Paul) Thomas; fond grandmother of the late Melissa, the late Michelle (Brian), Jessica, Pauli, the late Dena, Philip, Carli, Jayme (Anthony) and Paul; adored great-grandmother of 12; fond aunt and friend of many. Visitation will be Wednesday, February 6, 3:00-8:00 PM at Overman-Jones Funeral Home, 15219 S. Joliet Rd. (Corner of Rts. 59 & 30), Plainfield, IL 60544. Additional visitation will be Thursday, February 7, 9:00 AM until the start of the service at 10:00 AM at the funeral home. For more information, please visit www.overman-jones.com or call (815) 436-9221. To send flowers or a remembrance gift to the family of Anne M. DiGrazia, please visit our Tribute Store. "Email Address" would like to share the life celebration of Anne M. DiGrazia. Click on the "link" to go to share a favorite memory or leave a condolence message for the family.